Let’s face the facts. Most SMBs are unhappy with their current CRMs but nervous about switching to another system, even if that other app is more powerful, more affordable, and easier to use. We’re excited to announce a new Getting Started Guide to Sales Enablement in Agile CRM. As an all-in-one solution for sales, marketing and web engagement, we offer so many features that it can be easy to miss some of the more basic ones when you’re setting up your first Agile CRM account. Follow the 10-step Getting Started Guide and you won’t miss a single feature — or a single lead. If you’re tired of your old, overpriced, clunky CRM but have been afraid to switch, this quick-start guide will help to clarify the process and get you started with Agile CRM. And if you are already a dedicated Agile CRM user, the new guide is an excellent refresher course. We’re strong believers in the philosophy of Beginner’s Mind. There’s never been a better time to get going with our modern, intuitive UI and the power of complete sales enablement. We’re here to help you build a better business. Below you’ll find our basic sales onboarding video, plus links to each section in the new Getting Started Guide to Sales Enablement. Enjoy! Watch this video for a quick introduction to sales enablement in Agile CRM. The video is also available by clicking the academic cap (“Help”) icon on your main Agile Dashboard. Our new Getting Started Guide will get your sales team up and running with Agile CRM in 10 easy steps. Sync your email, sync your calendars, start adding and tagging contacts, and create your first deal today! Contacts – Contact Management is at the heart of Agile CRM. Learn how to get started with Contacts and Companies, including manual creation of contacts, importing/exporting contact data, and how to sync contacts from other apps you use, such as Google Contacts, Stripe, Shopify, FreshBooks and QuickBooks. Custom Fields – Need to create custom fields for Contacts, Companies, Deals or Cases? No problem. Tags – Learn how to create and manage Tags in Agile CRM. Tagging lets you easily sort, filter, segment and target contacts with campaigns designed around their specific interests and actions. Filters – Filters create more powerful searches and views. Get started with Basic Filters and Custom Filters in Agile CRM so you can always find exactly what you’re looking for. Bulk Actions – Learn how to perform Bulk Actions on multiple Contacts or Companies at once, such as adding all of your contacts to a particular Newsletter Campaign. Appointment Scheduling – Learn how to put your appointment calendar online, add it to your website, and include a personal scheduling link in emails and campaigns. 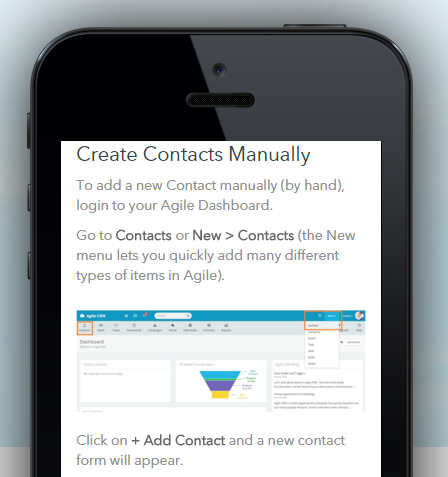 Contact Pages & Widgets – Learn how Contact Pages work in Agile. Get the most out of contact pages with dynamic contact views and widgets that automatically pull contact data from other apps. Email Sync – Easily sync your Gmail (Google Mail), Microsoft Office 365, or IMAP email account with Agile for a complete view of customer communications. Calendar Sync – Sync your Google Calendar or Office 365 Calendar with your Agile Calendar for more productive time management. Deals – Learn how to create and manage Deals in Agile CRM. Custom Deal Tracks and Milestones make it easy to establish repeatable sales pipelines for smarter selling. Thanks for selling smarter with Agile CRM. If you have questions about our new Getting Started Guide, we’re never more than just a click away. New to Agile? Sign up and launch your first campaign today. PS. Stay tuned for the next onboarding guide, Getting Started with Marketing Automation in Agile CRM, coming in early 2016!